This is the closest hotel to the Disneyland Resorts main pedestrian entrance, and just minutes away from all the action! Step outside this Anaheim hotel and you'll find yourself right in front of Disneyland , Disney's California Adventure and Downtown Disney . Looking for more to do? Travel a few more miles and you can delight in visiting Angel Stadium, Honda Center, Knott's Berry Farm and Soak City , Pirate's Dinner Adventure, Medieval Times and much more. Delight in being just a short drive away from the water - Huntington Beach, Newport Beach and Santa Monica are all less than an hour away. In town for a convention or a business event? You won't have to travel far, as the Anaheim Convention Center is nearby. Traveling is easy and stress-free - John Wayne Airport is just 15 miles from this California hotel. Looking for a convenient and delicious meal? This Disneyland area hotel offers easy access to Downtown Disney , which is home to a variety of restaurants. Retail therapy can also be found nearby at Downtown Disney and the Outlets at Orange. Relax on-site at this Disneyland hotel by relaxing or splashing around in our outdoor pool. Guests can also enjoy a gift shop, a 24-hour front desk, guest laundry, outdoor parking with a $10 per night fee and Disneyland Resort Park Hopper tickets available for purchase. A stay at this Anaheim hotel offers abundant amenities - enjoy cable satellite television with the Disney Channel , a microwave, a refrigerator, a coffee maker and free Wi-Fi in the clean, spacious rooms. Get the perfect start to each day with a complimentary continental breakfast. If you're traveling with a big group or as a family, our mini-suites sleep up to six people. For an extraordinary trip to the Disneyland area, make a reservation at the Best Western Plus Park Place Inn - Mini Suites today and save! From: All directions. 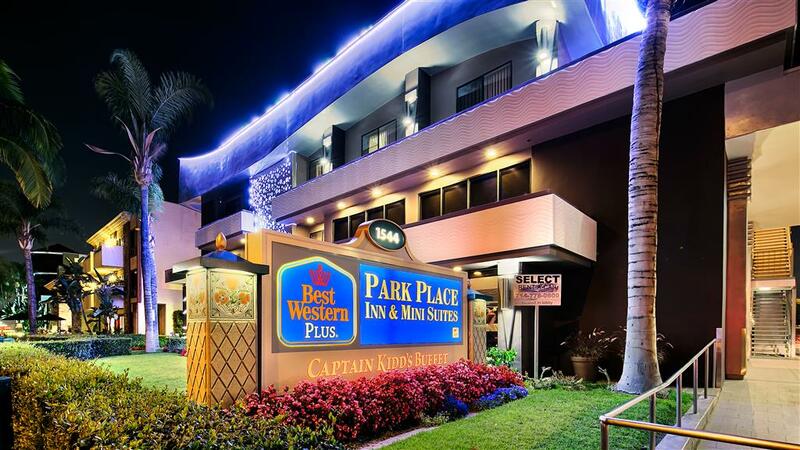 Best Western Plus Park Place Inn - Mini Suites is across the street from Disneyland Park. We are half block south of Interstate 5 on Harbor Boulevard. 3.00 mile(s) from Crystal Cathedral, nearly 3,000 seats designed by world-class architect Philip Johnson. Experience the California sun as it fills this all-glass church with sparkling light.